This time I’m digging into probably the biggest piece of software I’ve done yet, iZotope’s brand new “is-it-a-drum-machine-or-is-it-an-effect” BreakTweaker. Co-created with electronic musician BT (who also helped design the excellent iZotope StutterEdit which I use all the time), this is a piece of software that will definitely be working its way into my regular songwriting process. Before I get into what makes it special, let me give you a little bit of back story about me. For the past 15 years of making music, I’ve stayed away from drum machines, drum patterns, loops, breaks and drum sequencers. It’s just not the way I do things. I will occasionally add a loop into the chorus section to beef up the percussion for a couple bars, but very rarely, and even when I do, it’s only to augment the drum beat I played out on my keyboard. It’s not that I have anything against that way of doing things… The industrial music I got into this stuff because of was all done with sequencers and drum machines, and most of my favorite hip-hop beats all use breaks and loops. Maybe it’s a control freak type of thing, I don’t know, but I just like knowing I hit all the notes (even if it’s on a keyboard and not an actual drum set). But with all that said, BreakTweaker is just different and for my purposes, worth using. It’s not just taking your kicks snares and hi-hats and making patterns, although you could certainly just use it to do that. 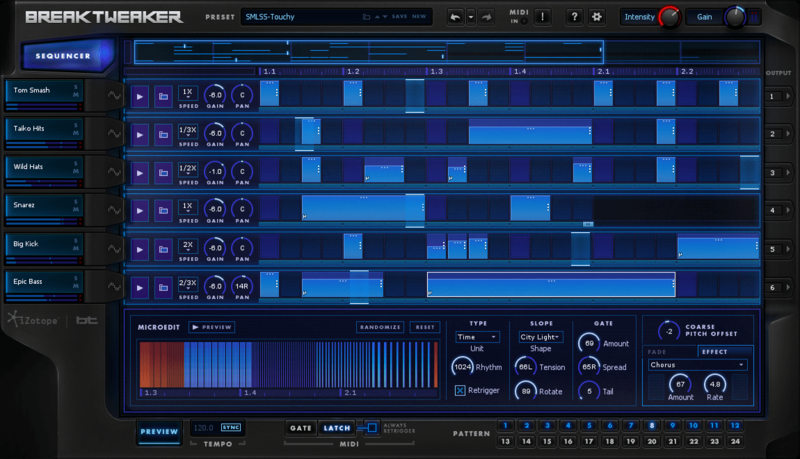 The sequencer module is extremely powerful and easy to use. But it’s the other 2 modules, the Generator and MicroEdit Engine that set this thing apart. With the Generator you have built in tools to create your own drum sounds. You can combine and tweak until you find exactly the right kind of sound for each piece of your digital kit. The built in kits are already a great place to start though, and for the purposes of my review track up above (you did listen, right?) I didn’t dig into the Generator module too much. Where I had the most fun was in the Sequencer and most improtantly, the MicroEdit Engine. Playing with the MicroEdit Engine feels like you’re using an instrument that someone brought back from the future. iZotope says you can “manipulate audio at a molecular level” and they’re not kidding. You can take any clip from the sequencer and adjust its pitch, rhythm and texture by adjusting the easy to use knobs. You can take a normal snare drum and pretty much just destroy it… in a good way. Make it stutter, make those stutters pitch shift, transform the changes mid-change. It’s simply insane the amount of room you have to experiment. The Randomizer button adds crazy ideas to your selection which you can then learn from, figuring out how each setting actually effects your sound. For the sample track, “Broken Glass,” I started out with two instances of BreakTweaker, each with a different but fittingly similar presets (Sin Bass & Tweak Woofer). Each preset loads an already made kit and 12 patterns, with 12 extra empty spaces to add and save your own patterns. I used a mixture of preset patterns and my own created ones. These are spread across the keyboard so you can trigger them easily, and below the patterns are each of the 6 pieces of your drum kit individually so you can add some custom playing to the mix as well. You can also start completely from scratch creating every piece of your kit and totally new patterns. Of course since this software is mainly for drums I added some other synths into the song as well, but everything percussion you hear is from BreakTweaker. So as you can imagine I’m absolutely recommending BreakTweaker. The drum tracks you can make with this thing are simply insane and if you even could make them without it (and that’s a big IF), it would take you hours of tweaking to do what takes seconds here. It’s a very specific kind of program and not for every kind of composer, but if you make any form of electronic or hip-hop music, you absolutely will not be disappointed. It’s currently on sale from iZotope’s website for $199 (regularly $249) or an expanded version with extra Expansion Packs for $249 (regularly $299).